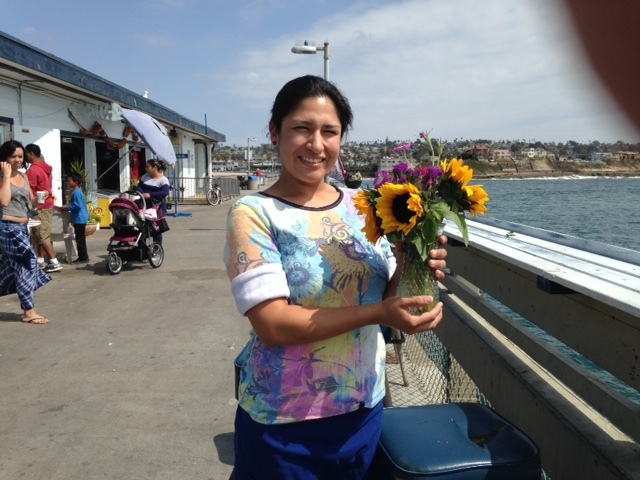 While walking on the pier today – a wondrous site appeared. 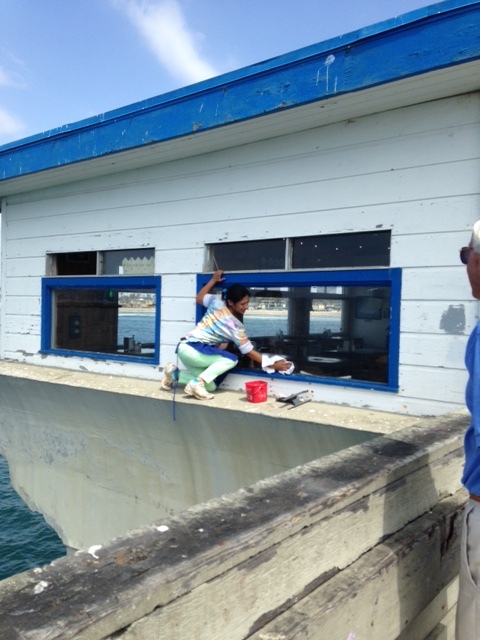 A beautiful young lady hanging over the window sill washing the windows of the “Ocean Beach Pier Café” without a safety net, a harness, or a rope, but wearing the biggest smile you can imagine. Meet Christine Mendoza, otherwise known as “Piper”. A resident of the Ocean Beach area for many years, but only 5 days on the job at the Café. When I asked her what she did before accepting this job, she said that she had worked in a beauty supply shop but it just wasn’t something she liked. She loves her new job; loves the view; loves the idea of looking out over her perch and seeing whales, dolphins, birds, etc. She said working where she is now is interacting with nature – a new adventure. She went to work at the Café because she had heard that the owner is a “spiritual” man and she is on a “quest to find her own spiritualism.” She thought that maybe he could help her find her own niche in her personal life. We were amazed to see the agility of this young woman; sitting on the eaves; nimble footed; unafraid; washing the windows and enjoying it. If you can’t picture the west side of the café, go have a look. Then ask yourself if you could do the same thing that “Piper” is doing. Does she do private homes? Not very smart if you ask me, but I’m glad she takes pride on her work. 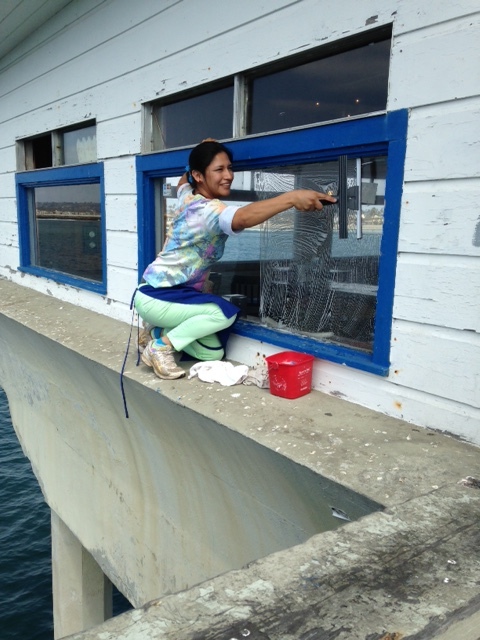 If a window washer works hard, he will eventually be able to purchase a 4plex in OB. I’m glad the little lady is happy. And I hope the Cafe has enough insurance to cover her hospital bills if she falls or will cover her bills if she falls. CalOSHA would cite the Cafe if they got wind of this. She should have some kind of safety harness on. I agree Geoff. I’m actually shocked the Cafe let her do this. They should know better from a business standpoint. Thank you all for your concerns. I volunteered to do it. Windows are not my specialty but I will if it helps everyone out no matter where it leads. I have sure footing and my will to not fall was enough to get the job done as needed. We had some people coming in from The FYI to do a segment on our Cafe with a cute young pregnant couple. I volunteered for that too. If the job asks for above and beyond thats what I will do. I am greatful to be working and helping my community out even when they want to try and put me down. Good luck!!! This lady gets right back up and keep on going stronger than before!!! If I had fallen I would need a change of clothes. No sweat??? ?Haven’t you heard the saying from Jamba Juice? I feel it rings true with everything you do in life; “Go Out On A Limb, That’s Where The Fruit Is???? And Just To Clarify, I Am The Hostess Keeping Our View Beautifully Fine!!!???????????????????????????????? There are no question marks at the end. Why are they on there? You guys are over thinking this situation.. Say she falls.. Omg!!!! its into the water!! Lol many many people jump off peirs, cliffs,etc ALL THE TIME. Lol I’m sure he had her sign something or w/e but regardless that takes some balls! Love you girl! Keep up the good work. Let’s go jump off that for shits and giggles one day!. ;) or something similar at least.. Thrills and chills for life. :) ????????????????? Christine….good luck to you. I bet you have made that restaurant sparkle! She sounds like a hard worker with a positive attitude. San Diego could use more people like her. Nice, I always enjoy people who love what they do.